I suspect you have a problem in the 1st line of your code. How do you expect someone to help you fix the problem if you have not posted any code, or even reported precisely what is or is not working ? If you on the other hand are requesting a ready-to-use code, this is not the right way. You should first try to turn ON at least one of the segments of the display, and only after it this step, in the case of nothing works, you should ask for help. In short, with the information you have provided up to now, it is not possible to help you. i said i want to know how to make the count stops when the pressure, i mean i want the code for button and (special operation code in full only to clarify) the count from 0 to 9 , and thank you . not into a picture not accessible..
Then maybe you will get some help.. Counter counts automatically and stops when button is pressed ? If yes, what happens if button is not pressed ? It will be counting till infinity ? In real life you would have taken the display in the hand, not to say the whole MCU! Can you imagine why? Also the web is full of 7 segment display examples in pic. A google search will confirm this in a few seconds. Try searching for TRIS and PORT registers in the datasheet. There you will get the answers. 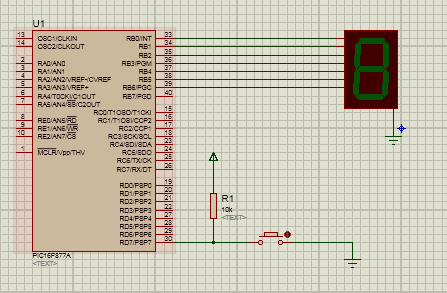 Hint: Start with something simpler, ie display is always off and when you press the button all leds go on. Easy to implement and solid as a scenario to build on. Read Tutorials online and then post exactly, what problem you are facing. 1. Added a reset button so that when counter is 9 you can reset the PIC to restart the counter. 2. It was not displaying 0 initially. Now it displays 0. You might also want to check out this tutorial on our sister forum community, Electro-Tech-Online, about 7-segment counters.